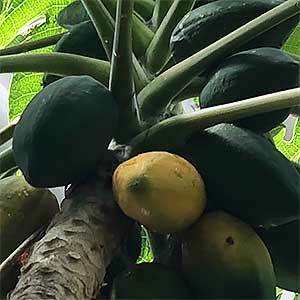 Pawpaw trees ( Carica papaya) are a tropical to subtropical fruit tree that reach around 3 – 4 metres in height. They require a humus rich moist soil and fruit in the warmer months. These trees produce either red or yellow fleshed fruits depending on variety. You will often see the the red fleshed fruit called Red Papaya, while the more common yellow fleshed variety is commonly called Pawpaw. Both of these can be picked before they are ripe and these are the green papaya used in many Asian cuisines such as green papaya salad and green pawpaw curry. The green papaya is said to have more nutritional value than the ripe ones. If you thinking of growing these in the home garden, they will only take around 1 year to produce fruit of quality and quantity. These are a fast growing tree and in good conditions can be grown from seed to fruit production in 12 months. They are not a long lived tree, generally replaced every 2 – 3 years when grown commercially. Some varieties are dioecious (male and female flowers on seperate plants) so for these varieties both male and female trees are required to produce good fruit, and the female trees do need to be pollinated to fruit. Other varieties are bisexual, so only one tree will be needed. You can attempt to grow papaya trees in cooler temperate climates, however they usually fail to fruit if subjected to very cold periods or frosts. Being native to Central America this is really tropical to sub tropical plant. In Australia, most commercial crops are grown in far North Queensland, north Tully. Most varieties for sale for the home gardener are a self pollinating type. They will produce good fruit as far south as Sydney, however only in a warm protected position. The red fleshed Paw Paw has a unique flavour. A deep flavour, juicy and sweet make this an outstanding tropical fruit. Remove the seeds and the skin and this fruit can be eaten fresh or added to fruit salads. Frost can be a problem, as they will drop the foliage and then take a few months to recover. Persistent frost will kill the plant. The variety you are looking for will be most likely named Southern Red. 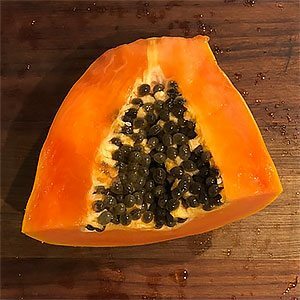 Paw paw (papaya) are reputed to have a number of health benefits, high in antioxidants, vitamin C and B and an excellent source of fibre. You can also use the fruit as a meat tenderiser. Best grown in tropical to sub tropical climates. A humus rich moist soil is essential for good fruit production. You will need a well drained soil, humus rich and for good fruit production you will need to fertilise the plant regularly. Regular watering will also be required to improve fruit production.. It is recommended to mulch around the plant to maintain a moist cool root run. Choose a protected position, cold winds and frosts need to be avoided. Full sun to a little shade in tropical climates. Plants can be pruned by tip pruning to encourage branching and reduce the height. A fertiliser such as Cow manure, Seamungus, or Dynamic Lifter applied in spring will be adequate in good soil. It is possible to grow red paw paw in containers, and this may be a solution for cooler climates. Loss of foliage – Generally due to cold climates. Fruit not ripening – Climate to cold.